Welcome to language-easy.org! Well, as you have clicked on this site, I suppose that you want to enter the real depth of German grammar. So, in this case, we will talk about German indefinite pronouns. Unfortunately, this kind of pronouns can be rather complicated sometimes. But, let’s be honest, there are not too much topics in German grammar which are really easy. Luckily, German indefinite pronouns are of high importance in the German language. And, well, this should also serve you as motivation! So, once you master this topic, you will be able to improve you spoken and written German significantly. 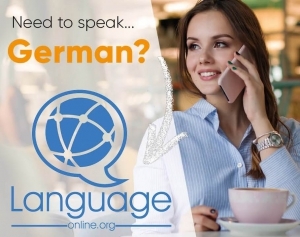 Nevertheless, there is a lot of practice needed and, of course, you will still fail a lot especially in the way you use German indefinite pronouns in the correct kind of way. But, I am convinced that you are a smart person and this topic won’t be too complicated for! So, let’s go straight ahead and talk about the importance of German indefinite pronouns in the German language. What are German Indefinite Pronouns? Was sind Indefinitpronomen im Deutschen? First of all, we should clear up what we are actually talking about! So, German indefinite pronouns are of high importance in the German language, as I already told you. Well, they include “etwas, nichts, jeder, man, jemand, niemand…” and so on. For sure, you have seen or heard most of them already. Well, similar to personal pronouns, German indefinite pronouns replace people or things. Especially compared to personal pronouns, German indefinite pronouns always have a general meaning. So, they can not stand for a specific person or a thing. Well, after clearing what German indefinite pronouns actually are, let’s illustrate them in some examples. Indefintie Pronoun: “Du hast mir nichts mitgebracht!” – You haven’t brought me anything! Without indefinite pronoun: “Du hast mir mein Spielzeug nicht mitgebracht!” – You haven’t brought me my toy! In the following, I’d like to talk about the first kind of German indefinite pronoun. So, indefinite pronouns which stand for people. First of all, we will talk about German indefinite pronouns describing people. Well, especially about the most important ones “man” (everybody), “jemand” (someone) and “niemand” (nobody). So, let’s start right ahead without loosing too much time. Maybe, “man” can be seen as the most important German indefinite pronoun describing people. Of course, “man” is absolutely impersonal and it’s direct translation could be “everybody”. So, in the case of “man”, it’s always in the third person singular and has to be declined. Well, it’s a simple combination of “man” and the declined forms of the indefinite article. Of course, here is an example that will show the way you have to decline this German indefinite pronoun. Now, we will have a look at the next German indefinite pronoun describing people. Well, these two types of German indefinite pronoun occur really frequently in the German language. Actually, there are also quite common in English, so I think it should not be too complicated for you. So, “jemand” and “niemand” also appear only in the third person singular. Whereas “jemand” refers to one unspecified person, “niemand” is it’s negative form. Theoretically, „jemand“ und „niemand“ has to be declined but the declension is often left out in informal language. So, that´s why the declension turned optional in official grammar as well. “Spricht hier jemand Spanisch?” – Does somebody speak Spanish here? “Niemand redet Dialekt?” – Nobody speaks dialect? Hopefully, you could understand the basic principles of how to use and form these German indefinite pronouns. Now, we will proceed to the indefinite pronouns describing things. 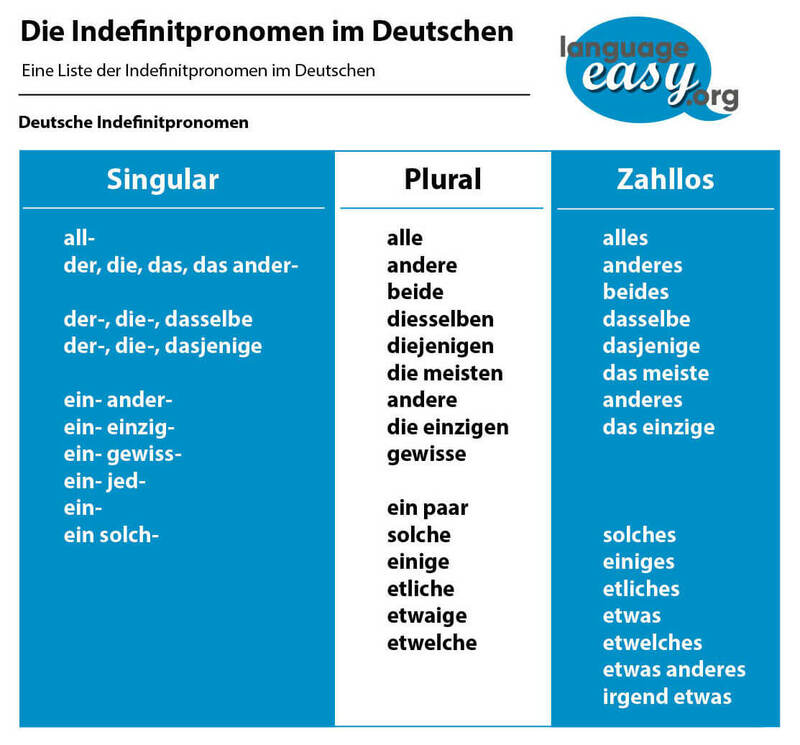 So, in this part of this article we will have a look at German indefinite pronouns describing things. Well, the most common pronouns in this context are “etwas”, “nichts”, “alles” and “welch-“. In the following, we will go into some detail about each of these pronouns. Luckily, “etwas” is a pronoun which is not changeable. So, this means that there is no denclension! Furthermore, you should know that it is used as a replacement for unspecified things or situations. Apart from that, it can be strengthened by the prefix “-irgend”. Here are some examples. “Willst du etwas machen?” – Do you want to do something? “Schenk mir irgendetwas!” – Give me anything as present! Unfortunately, there are two things you have to keep in mind when using “etwas”. First, in spoken language it is often replaced by “was”. Second, it’s meaning can sometimes be “ein bisschen” (a bit) and “ein wenig” (a few). So, it simply depends on the context. So, as one of the really important German indefinite pronouns, “alles” has to be mentioned. Well, it has a strong universal meaning and stands for things and actions. “Ich kann alles gut.” – I can do all well. “Mein Freund hat alles richtig gemacht”. – My friend did all corect. “Ich kann nichts dafür.” – It is not my fault. “Ich habe nichts beim Fischen gefangen.” – I did not catch anything, while I was fishing. So, as a last point in this article we want to talk about Indefinite pronouns for persons and things. Well, they can be used as articles words, tool. Actually, it is easy to differentiate between the pronoun and article word. So, if the noun stands straight behind the indefinite pronoun it is uses as an article word. And if it is the placeholder for the noun it is the pronoun itself. Of course, the difference is important because the declension is different in singular. First, we will have a look at the German indefinite pronoun “jede”. So, this pronoun has to be declined like a definite article. Logically, it receives the same ending as the article that goes before. Please, note that the noun that follows “jede” must be singular as it describes a particular part of a group. Here are some examples that show what I tried to describe. “Jeder will eine Fanta!” – Everybody wants a Fanta! “Ich hasse jeden auf diesem Schiff!” – I hate everybody on this ship. Well, „Einige“ and „manche“ in singular always refer to things. So, in case these German indefinite pronouns describe things, the ending is “-s”. Furthermore, in plural they can also refer to people and get the endings of the definite articles. Additionally, they stand for an unspecified amount. “Einige in dieser Stadt sind aus Deutschland.” – Some of this town are from Germany. “Manche von den Männern sind zu spät gekommen.” – Some of the men did come to late. Hopefully, you have learned some new things about German indefinite pronouns. So, especially about their different forms and, of course, the correct way to use them. Unfortunately, there are a lot of exceptions and additional meanings. Well, that’s something typical of German – you simply have to study, study, study. But try to think in possibilities German opens you: The country, the people and their culture. By the way, there is a good article on Wikipedia about German verbs and also there are some list of irregular ones. In the following you will see some phrases that you should complete with the correct terms. Once you have filled all the gaps, just click on the “correct” button and you can see your errors and the correct results. Good luck and .. auf Wiedersehen!